I read 10 books this month, most of them excellent reads that I could not put down. I loved this memoir. 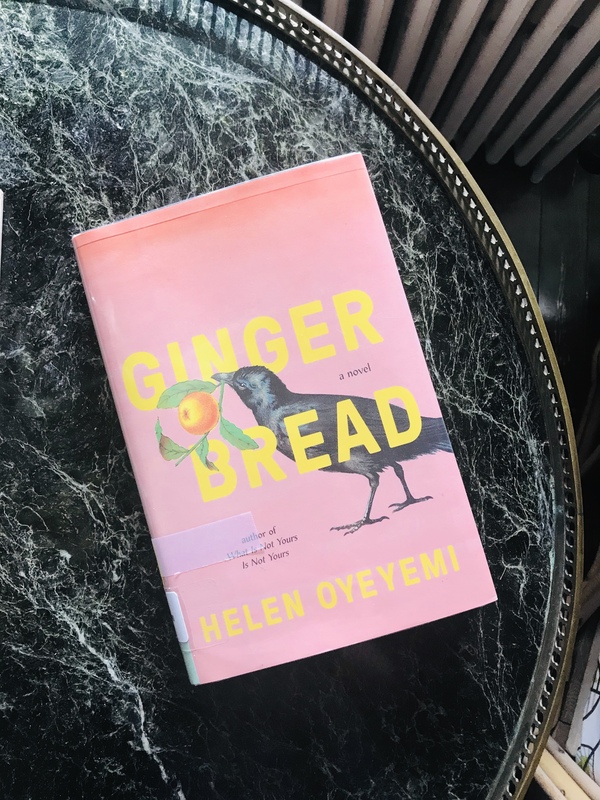 It was interesting that the author is Steve Jobs’ daughter but it was so compelling and well written that I would have enjoyed it even if her father hadn’t been famous. I read this in a couple of sittings. I got swept up in the characters’ lives and thoroughly enjoyed the experience. I love everything Anne Lamott has written and it was great to return to her writing. I loved this collection of short stories. I never would have found it in my own and I was surprised since my kids are grown that these stories would speak to me but they did. Highly recommend! Jen Beagen was a new to me author. Her book won’t be for everyone in light of somewhat explicit content but I loved her dark humor and unique voice. I can’t wait to read her new book (sequel) which is out now. I enjoyed When You Read This. A bit chick-litty but in a good way. I read this beautiful collection of poems. And this beautiful collection of letters. And I am thoroughly enjoying this murder mystery set in the South of France. I abandoned three books more than halfway through. And I got halfway through this one and just didn’t care enough about the characters to continue. I went to a favorite indie bookstore and bought this book which I can’t wait to read. Linking up to @annebogel today who is such a wonderful resource for great new books. I also find books I love through my favorite indie bookstore which just happens to be in Georgia. Check out @bookshelftville. Many of my favorite reads are books I got through their wonderful #shelfsubscription program. 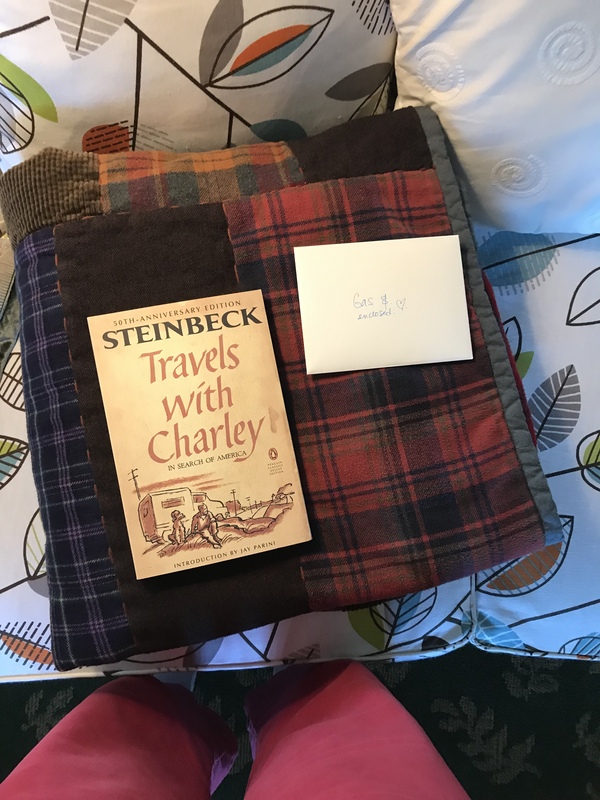 Sometime early in the new year, I gathered my odds and ends of heavy weight cotton flannel and cut up my much worn plaid Pearl shift dresses and decided to make a simple quilt for my son. I added some strips leftover from various corduroy sewing projects and assembled strips of varying lengths. I cut and sewed it fast without worrying about being super precise and it came together quickly. 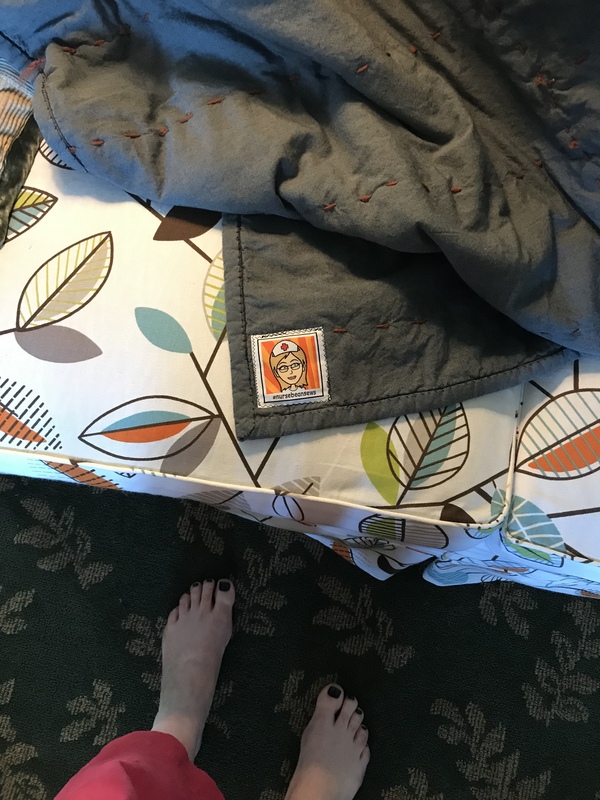 I used this charcoal cotton chambray for the back and binding. I love this fabric for quilts. I also used it for my first Tamarack Jacket. It is great for garments and quilts and I ended up buying it in several colors for future quilting projects. I decided that I would stitch it together using big stitches in a rust colored yarn. I like the rust stitches against the grey background. It didn’t occur to me until after I finished it, but the stitching on the back and the stripes on the front really do evoke roads and highways. 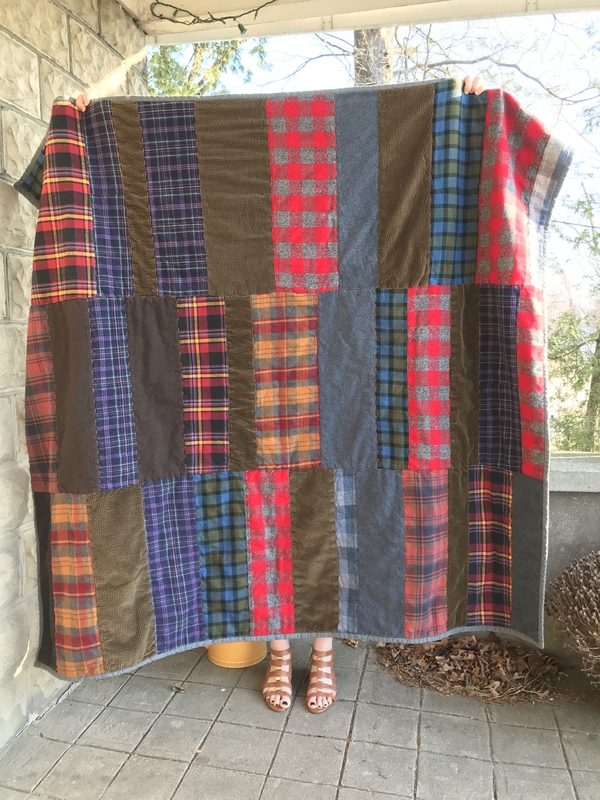 This quilt was made to hit the road. I have been trying different strategies to be more centered this year and have been using the screen time timer on my iPhone with great success. It makes a big difference to set a daily limit and have that visual reminder when you get there. But I am feeling that I need to do this in a bigger way. 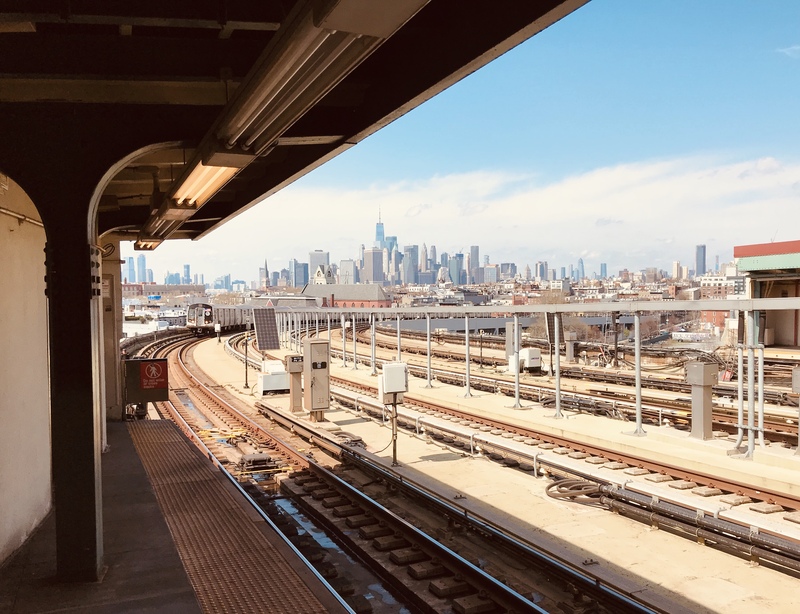 My brain functions differently when I force myself to take a break from the screens. So for the month of April I will be offline- reading, sewing, writing and most importantly exercising and spending time outdoors. Here is my stack of current reads which I hope to read this month. I will report back with book recommendations and some new garments to share. Spoiler alert: I already finished and loved Daisy Jones & the Six. It was the perfect easing into spring read. I have made the Made by Rae Isla Dress so many times I have lost count but they have all been in prints. I decided to use this grey heather cotton Lycra knit from my stash to make a slightly longer grey version with long sleeves borrowed from the Jade Top pattern for cooler spring days. I cut this out ages ago and finally sewed it up in a couple of hours on a Saturday afternoon. I didn’t even hem it. I know it will be worn a zillion times dressed up and dressed down. Now to buy some new necklaces to go with it. It is the perfect backdrop. For the many other Islas and some tips on sewing knits with a regular sewing machine, check out Sewing with Knits 101, Sewing with Knits102 and my Me Made May wrap-up posts here, here and here. Yay spring! The bees are back-seen in my flowers today! and I am focusing on using it in my sewing projects. One exception this winter was some corduroy that I purchased from Fabscrap, an amazing, volunteer-driven, non-profit organization whose mission is to keep fabric out of landfills by accepting donations from garment manufacturers and individuals and selling what is saleable to the public and then recycling what is left into industrial-grade felt that has many uses. 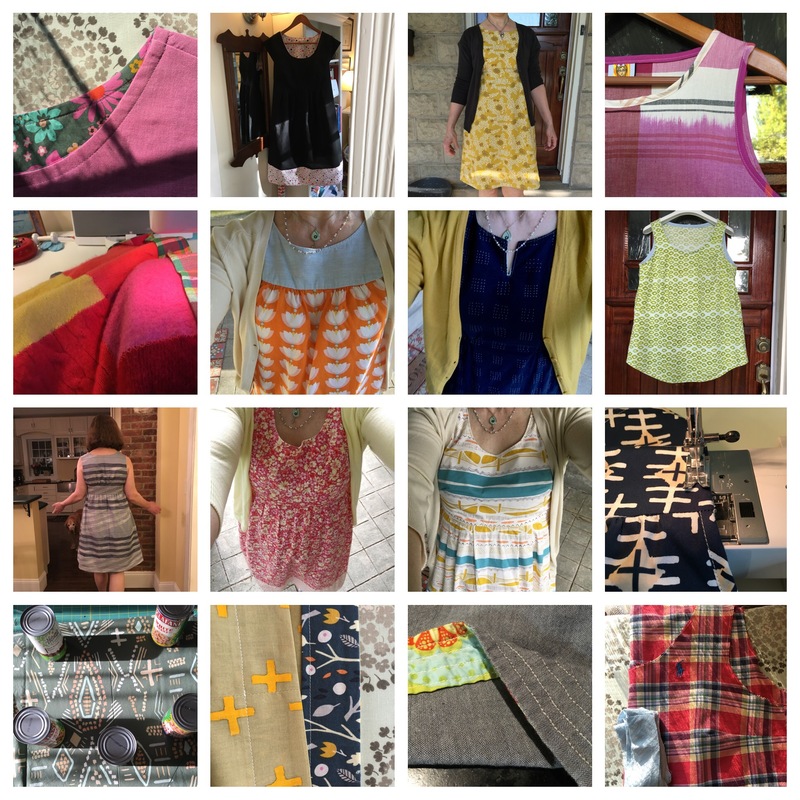 I had the opportunity to visit Fabscrap last fall when the Love to Sew Podcast hosts Caroline and Helen hosted a meet-up there. It was really fun to meet them and other sewists and to see this amazing operation in the Brooklyn Army Terminal. Volunteers sort the donated fabric and then have the opportunity to take some home. I love this business model! A great way to meet fellow sewists. Fabscrap has occasional “flashsales” online via Instagram and when I saw wide-wale cotton corduroy for $5/yard I hopped on it. 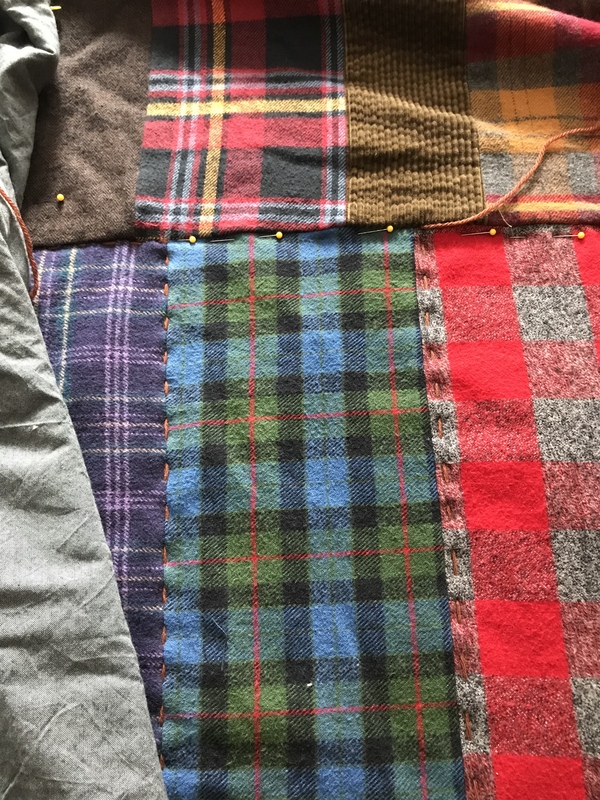 I have used it to make this York Pinafore which I have been wearing all winter and thought it would also be great for a second Tamarack Jacket. Turns out I was right! and I was surprised how well it worked. I used a dark grey thread in my stash since there was no brown in my lining fabric and it was fine. I set my stitch length to a long length- I think I set it all the way to 4 but it might have been 3. I decided to have my quilting a bit wider apart. 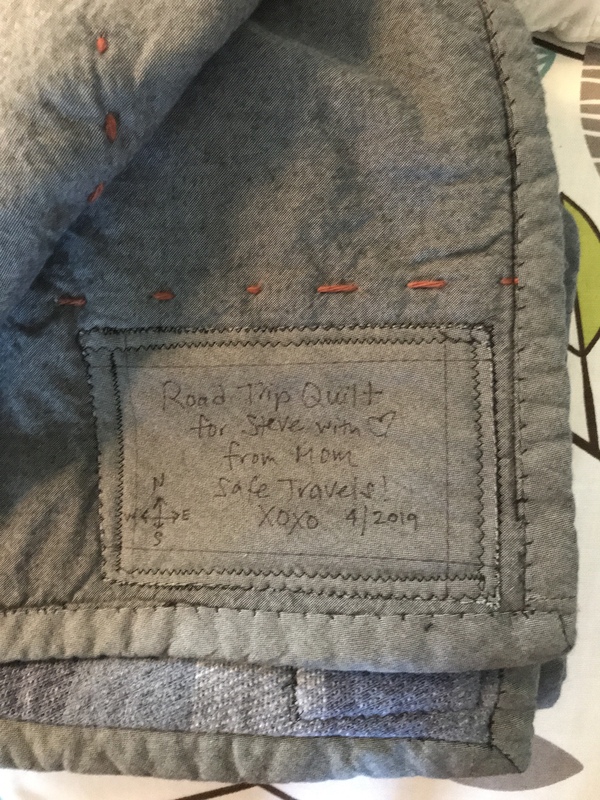 When I made my first version in cotton chambray, I quilted a slightly flattened diamond pattern about 3 inches apart. 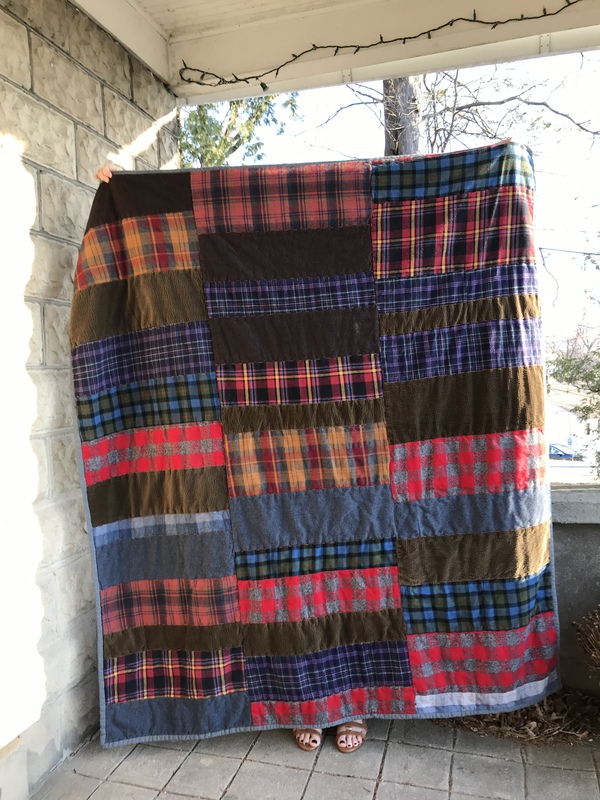 With the corduroy, I decided to quilt using a 4 inch grid. I used the corduroy to orient myself and then set my ruler to 45 degrees to draw the quilting lines with my chalk liner. and then used it to determine where to draw the next lines. I basically quilted an X and then quilted new lines working my way up and down the pieces. It went really quickly and was very satisfying to sew these straight lines. 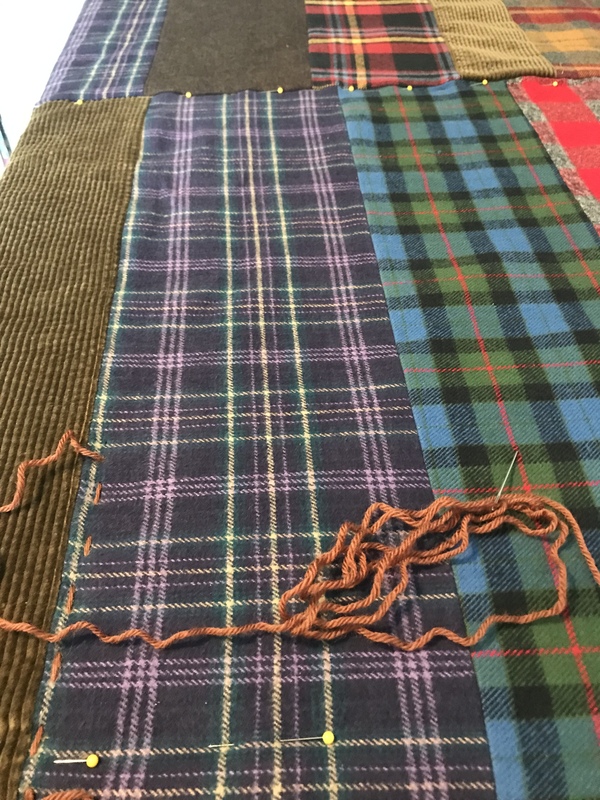 Something that I did with my second Tamarack was to cut the pieces of batting and lining fabric a bit bigger than the outer corduroy pieces. I didn’t have much shifting but this way after quilting everything I just used my rotary cutter to trim everything using the outer corduroy pieces as my guide so everything would line up nicely before sewing the jacket together. I don’t recommend cutting all three pieces bigger because I think you want to be able to orient your quilting lines on the outer piece knowing how it will line up in the finished garment. I used a heavyweight cotton flannel to line the jacket. I wear my first Tamarack all the time but it is relatively lightweight and I wanted a version that was warmer for those colder spring and fall days. I was a little worried about the thickness of all of these layers but the only place this came into play was when I sewed my bias binding on and an area where I had joined two pieces lined up with one my corners with the bulk making it a little wonky. What I ended up doing was to switch the way my jacket opens so that the less wonky corner is on top. I could have unpicked the binding and re-sewn it so that the bulk wasn’t at the corner but it didn’t bother me that much. As I did with my first Tamarack, I sewed the binding strip on in a single layer and then turned it under and handstitched it in place. I love the way the diagonal lines in the corduroy look in the bias binding. It was worth the stress of sewing all that bulk! but in the end, went with heavy duty coppery snaps from Joannes. I bought the handheld snap setter which wasn’t too expensive and works great. My better than a hammer. Totally worth the purchase. The most stressful and then satisfying parts of the Tamarack are the welt pockets. I almost didn’t add them since again I was worried about corduroy bulk but I just love them in my first version. They are just the right size and shape for hands and keys and my phone. So I was brave and added them and was so glad I did. 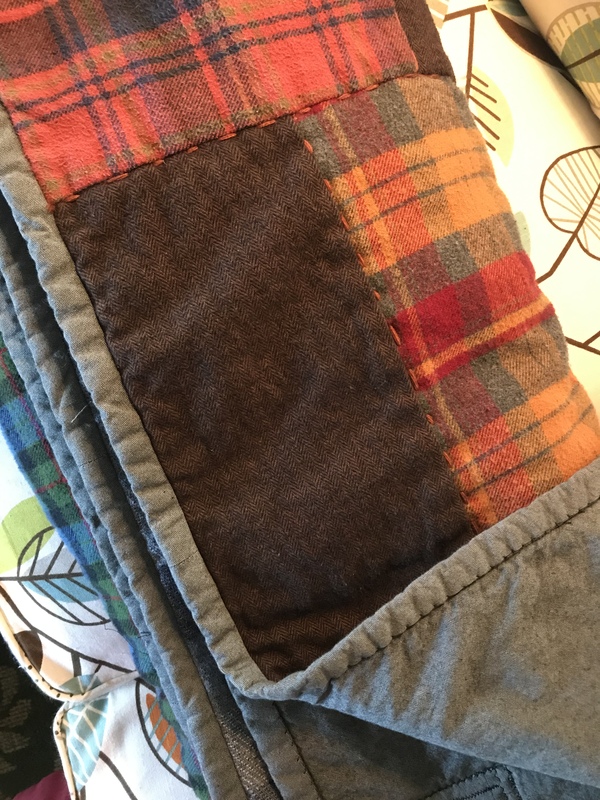 I have not been successful in making the inside view of the pockets cute so I adapted a little hack where once the pockets are sewn, I hand-sewed a rectangle of fabric over the inner view of the pocket. Now they don’t swing around and I think it just makes everything more durable. I highly recommend this approach. Size-wise I had made a straight 12 last year when I made my first version. I had actually cut it out a bit longer and had lengthened the sleeve pieces but once assembled I found that I didn’t need the length in either place which surprised me and I trimmed them back to the proportions exactly as drafted. I am 5’91/2″ and my torso is very long-I usually add 2 inches to all tops-but the proportions as drafted were perfect. I made my first version one year ago and I have put on some weight this year but I made the same size and it was just fine. For reference, right now my bust measures 37″ and my hips are 42 1/2″ and here is the size chart for the Tamarack. I chose my measurements based on my bust but I am pretty sure my hips were smaller last year but since I knew that my jacket still fit me perfectly, I didn’t grade between sizes because I didn’t want to shift the proportions of the jacket. The fit is a bit loose and slouchy in a good way. I can wear two light layers underneath but it doesn’t really allow for a heavy sweater. If you plan to wear your jacket with heavier layers, I would suggest making a muslin. My shoulders are somewhat sloped and the dropped sleeves work well for me. I have plenty of room in the shoulders. The fit is really just right. The best part of both of my Tamaracks is how comfortable they feel when I wear them. They really are just light wrapping yourself in a comfy quilt. I think I washed my fabrics twice before cutting just because they both were cotton and subject to shrinkage. This would not be a bad idea if you are concerned about shrinkage. I used scraps of quilt batting left over from quilting projects. This is such a great pattern for that. 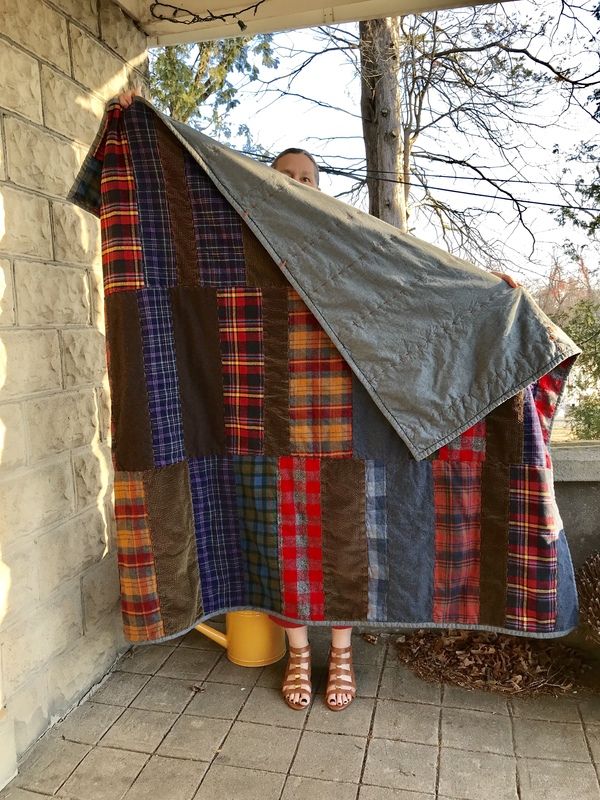 It is important to use quilt batting that doesn’t require close quilting. The all-cotton batting I use, Warm and Natural, can be quilted or tied so it is perfect. I didn’t bind the inner seams with bias binding as some people do. It is a pretty look but all that bulk just overwhelmed me. I zigzagged the edges and in some places hand sewed the seams together with an overcast stitch to reduce fraying. Here are many pictures of both jackets as worn after washing and drying it in my machines. I have not found any issue with it not fitting after washing-on the contrary the washing softens everything up and it fits better. I know from my experience as a quilter that these will just get softer and nicer to wear with age. (with the corduroy I had no choice since I just couldn’t get some parts of the assembly under the presser foot. I will definitely make this pattern again. I would love to sew a very light-weight version in linen or double gauze and hand-quilt the pieces. Feel free to ask any questions below. I can’t recommend this pattern more highly! I read four wonderful books this month, each completely different from the next. I can’t recommend them more highly. Also- Spring!!! I planted 100 bulbs last fall. It was warm this week in Connecticut and one poked its way up through the ground. I love this time of year! These are all such good reads. Highly recommended!